Every now and then I come across a tool that is so bogged down in pages of esoteric mathematical calculations, it becomes difficult to get even a simple grasp of how or why they might be useful. Even worse, you exhaustively search the internet to find a simple picture that might express a thousand equations, but find nothing. The kalman filter is one of those tools. Extremely useful, yet, very difficult to understand conceptually because of the complex mathematical jargon. Below is a simple plot of a kalman filtered version of a random walk (for now, we will use that as an estimate of a financial time series). The kf is a fantastic example of an adaptive model, more specifically, a dynamic linear model, that is able to adapt to an ever changing environment. Unlike a simple moving average or FIR that has a fixed set of windowing parameters, the kalman filter constantly updates the information to produce adaptive filtering on the fly. Although there are a few TA based adaptive filters, such as Kaufman Adaptive Moving Average and variations of the exponential moving average; neither captures the optimal estimation of the series in the way that the KF does. In the plot in Fig 1. 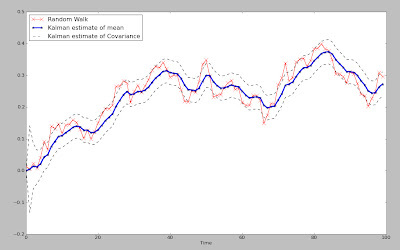 We have a blue line which represents the estimated dynamic 'average' of the underlying time series, where the red line represents the time series itself, and lastly, the dotted lines represent a scaled covariance estimate of the time series against the estimated average. Notice that unlike many other filters, the estimated average is a very good measure of the 'true' moving center of the time series. Although these equations are often expressed in state space or matrix representation, making them somewhat complicated to the layman, if you are familiar with simple linear regression it might make more sense. A is the state transition matrix, or I often think of it as similar to the autoregressive coefficient in an AR model; think of it as Beta in a linear regression here. w is the noise of the model. So, we can think of the equation of x=Ax-1 + w as being very similar to the basic linear regression model, which it is. The main difference being that the kf constantly updates the estimates at each iteration in an online fashion. Those familiar with control systems might understand it as a feedback mechanism, that adjusts for error. Since we can not actually 'see' the true dynamic center in the future, only estimate it, we think of x as a 'hidden' variable. The other equation is linked directly to the first. 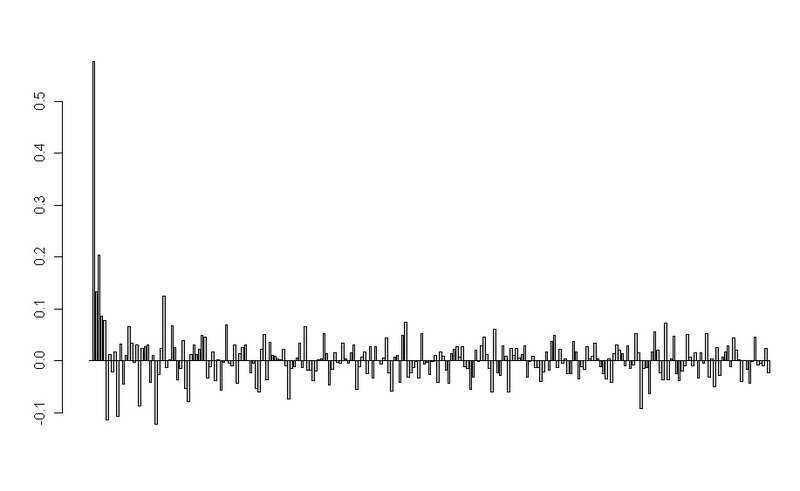 zt is the measured noisy state variable that has a probabilistic relationship to x.
xt we recognize as the estimate of the dynamic center of the time series. v is the noise of the model. Again, it is a linear model, but this time the equation contains something we can observe: zt is the value of the time series we are trying to capture and model with respect to xt. More specifically, it is an estimate of the covariance, or co-movement between the observed variable, the time series value, and the estimate of the dynamic variable x. 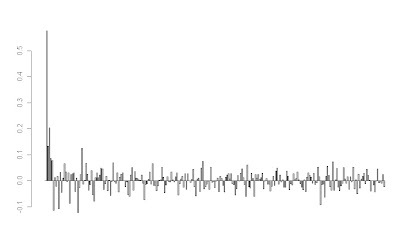 You can also think of the scaled envelope it creates as similar to a standard deviation band that predicts the future variance of the signal with respect to x. Those familiar with hidden markov models, might recognize the concept of hidden and observed state variables displayed here. xt_new_est=xt_est + K*(zt - H*x_est). 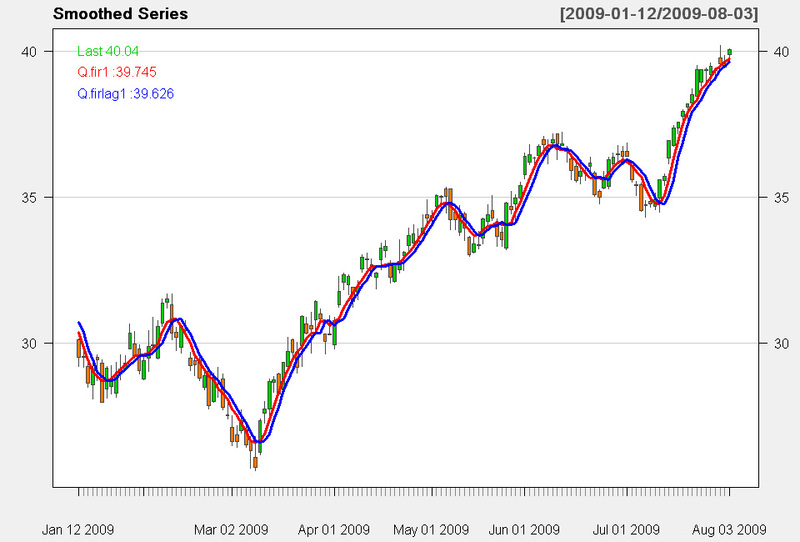 The value of K generally converges to a stable value, when the underlying series is truly gaussian (as seen in fig 1. during the start of the series, it learns). After a few iterations, the optimal value of K is pretty stable, so the model has learned or adapted to the underlying series. Some advantages to the kalman filter are that is is predictive and adaptive, as it looks forward with an estimate of the covariance and mean of the time series one step into the future and unlike a Neural Network, it does NOT require stationary data. Those working on the Neural Network tutorials, hopefully see a big advantage here. It has a very close to smooth representation of the series, while not requiring peeking into the future. Disadvantages are that the filter model assumes linear dependencies, and is based upon noise terms that are gaussian generated. As we know, financial markets are not exactly gaussian, since they tend to have fat tails more often than we would expect, non-normal higher moments, and the series exhibit heteroskedasticity clustering. Another more advanced filter that addresses these issues is the particle filter, which uses sampling methods to generate the underlying distribution parameters. Here are some references which may further help in understanding of the kalman filter. In addition, there is a kalman smoother in the R package, DLM. Not only is there a fantastic writeup on hidden markov models and kalman filters, but there is real code you can replicate. It is one of the best practical books on Machine Learning I have come across-- period. Is it possible to get a causal smoothed filter ? Although I haven't been all that much of a fan of moving average based methods, I've observed some discussions and made some attempts to determine if it's possible to get an actual smoothed filter with a causal model. Anyone who's worked on financial time series filters knows that the bane of filtering is getting a smooth response with very low delay. Ironically, one would think that you need a very small moving average length to accomplish a causal filter with decent lag properties; often a sacrifice is made between choosing a large parameter to obtain decent smoothing at the cost of lag. I put together the following FIR based filter using QQQQ daily data for about 1 year worth of data. It is completely causal and described by .. gasp.. 250 coefficients. Does it appear smooth? You decide. The impulse response is approximately a sinc function, which is the discrete inverse transform for an ideal 'brick wall' low pass filter. I haven't actually verified much out of sample at the moment, so it's quite possible that the model may not fare as well; it remains to be investigated. However, thought I would share this work to give some ideas about potential of causal filtering methods. Labels: Is it possible to get a causal smoothed filter ?